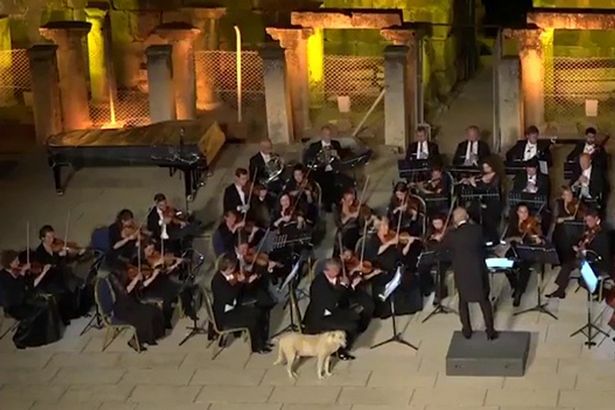 A curious dog managed to upstage a talented orchestra after crashing their open-air performance to take centre stage. The adorable pooch was spotted by amused audience members watching a classical musical concert in Ephesus, Turkey. Unconcerned about gatecrashing the evening, the dog leisurely wandered onto the 'stage' and had a curious look around, just as the band of musicians worked up to their crescendo. As the performance becomes more dramatic the dog reaches the centre of the performance area and appears to decide enough is enough. Copyright© あんてなちゃん（ニュース系）	, 2019	All Rights Reserved.